It is a Sunday in peak summer time and Delhi’s Lajpat Nagar area is full of its hustle-bustle. Its narrow lanes are packed with shoppers while street vendors adorn the sides of the lanes. In the middle of the innumerable shops is a shop, which has something different about it. Najeebullah, an Afghan national, in his early thirties runs the shop, Afghan General Store. He came to India in 2013, to escape the violence and conflict in Afghanistan. While his store offers all general items, it also has special items to specifically cater to its Afghan customers. As he looks on to the street, and sees many men in the traditional Pathani outfits and women in the fashionable abayas, he cannot help imagine that this could well be a street back home in Afghanistan. For him, the store is not merely a business or simply a means to earn money but a safety net, and a wall for himself, his wife and his two young children, against the violence and conflict in his home country. Not far from the shop, Ghulam Nabi, who came to India in 2010, lives in a one-room barsati with his family. His son had escaped to Pakistan’s city of Peshawar from Afghanistan but he has not heard from him since. He now lives with his wife and two daughters – one of whom has even got married to another refugee. He operates a restaurant in the nearby Muslim dominated area of Delhi’s Nizammudin, and like many others who live with him, he has no intention to go back. As Anwar, another refugee admits, that living in a one-room house may be a far cry from the five-bedroom house he had in Kabul. But he is happy in the knowledge that now his daughters and wife are safe and won't be accosted on the roads for not wearing a chadar. Delhi’s Lajpat Nagar area, which was initially planned as a designated place for partition refugees, became a place of choice for Afghan refugees, fleeing violence, conflict and persecution in their country. The streets of this locality are lined with Afghan shops and restaurants while traditionally dressed women, men and children are seen swarming through the streets. This research attempts to take a glimpse in to the lives of these Afghan refugees in Delhi. Their struggle does not end with the grueling and life-threatening course of escaping threats and insecurity in Afghanistan. But in fact finding a new home away from home has its own challenges. 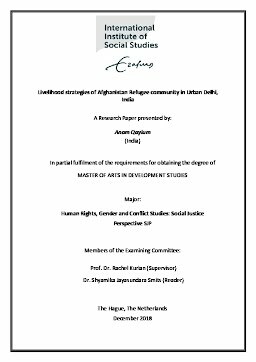 This research is an endeavor to explore and uncover the challenges and insecurities the Afghan refugees face in Delhi, their capabilities as indi-viduals and as a community, and the coping mechanisms they have employed to “thrive” in Delhi – making Lajpat Nagar, the “mini-Kabul”.